Located in Myrtle Beach (South Myrtle Beach), Crown Reef Resort is within a 10-minute drive of The Market Common and Family Kingdom Amusement Park. 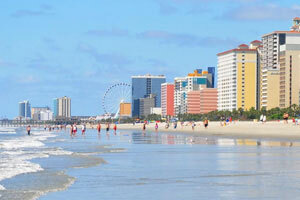 This beach hotel is 3.6 mi (5.9 km) from SkyWheel Myrtle Beach and 5.8 mi (9.4 km) from Ripley's Aquarium. Make yourself at home in one of the 514 air-conditioned rooms featuring refrigerators. Rooms have private balconies. Complimentary wireless Internet access keeps you connected, and cable programming is available for your entertainment. Bathrooms have shower/tub combinations and hair dryers. Dip into one of the 2 outdoor swimming pools or 11 spa tubs and enjoy other recreational amenities, which include a complimentary water park. This hotel also features complimentary wireless Internet access, an arcade/game room, and gift shops/newsstands. Grab a bite to eat at one of the hotel's many dining establishments, which include 2 restaurants and a coffee shop/café. Unwind at the end of the day with a drink at the bar/lounge or the poolside bar. Cooked-to-order breakfasts are available daily from 7 AM to 11 AM for a fee. Featured amenities include a computer station, express check-out, and a 24-hour front desk. Planning an event in Myrtle Beach? This hotel has facilities measuring 10000 square feet (929 square meters), including conference space. Self parking (subject to charges) is available onsite. The preferred airport for Crown Reef Resort is Myrtle Beach, SC (MYR).